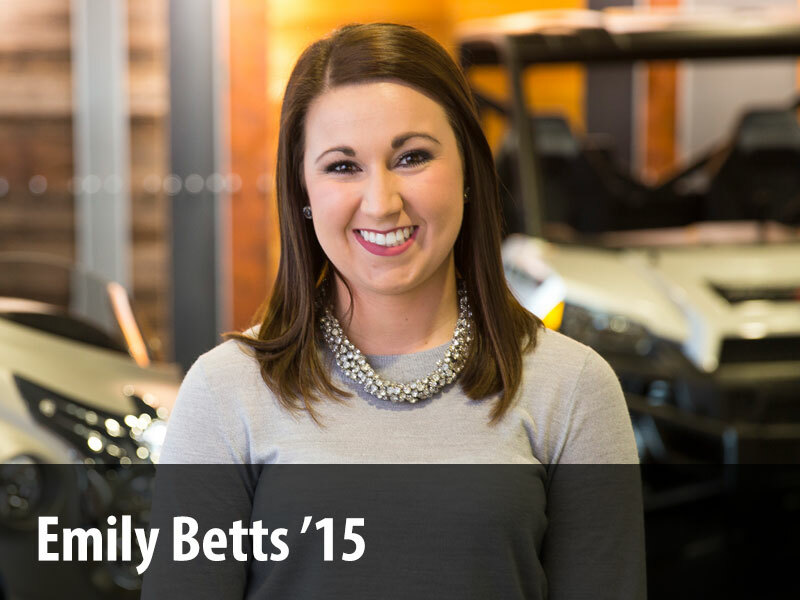 Every employee is responsible for backing up data on a regular basis. With advances in technology and reduced cost in storage media, the process has become easier and faster than ever before. ITS recommends that you backup your computer at least once every month. Apple makes it simple for you to backup your data by using drag and drop techniques. Backing up data to a CD-RW and other media on a Mac is covered in this ITS training documentation. The primary reason for backing up your data is that failures do happen. To be ready for computer failures, we want you to backup your data. A backup procedure is easiest if all the files needed to be copied are in one upper-level folder instead of scattered about. That folder is simply copied to a CD-RW or a network drive. When a big problem occurs, you may need to get a new computer, or your old one may be taken away to be “reformatted.” Either way, you will get a computer with program files and your data files will be restored either from the old hard drive or from your backup. It is recommended that you store confidential information on your home network share rather than on your computer. You may store all of your data on the network where it is backed up daily for you by a nightly schedule and where it cannot be lost if your computer crashes or is stolen. There are many network shares available, depending upon who else you want to be able to see the documents. For more information on network shares, read Mac Network Shares . Data that is on your computer should be placed in the “Documents” folder on your computer’s hard drive and the “Documents” folder should be backed up on a regular basis. Some files are not stored under “Documents” by design. For example, Firefox bookmarks, Safari bookmarks and shortcuts on your desktop. 3. A window will ask what to do with the blank CD-RW, select Open Finder and click OK.
4. A CD icon will appear on your desktop and in your Finder’s sidebar. 5. Navigate to the folder that you want to backup. In this example we will be backing up “Documents”. 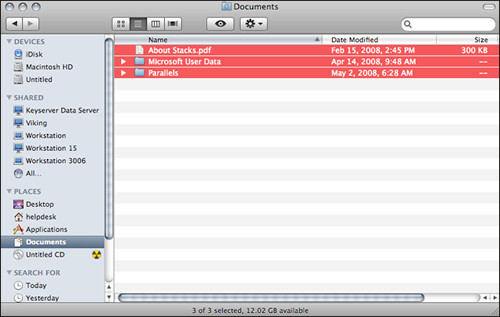 Navigate to Documents in your Finder. 6. Click Edit > Select All or simply press CMD+A. Now all your files in Documents are highlighted. 7. Click Edit > Copy. 8. Navigate back to the Disc on your Finder. Simply click on the disc icon on your sidebar. 9. Click Edit > Paste and the files will copy over. 11. The following window pops up asking for a burn speed and for you to name the disc. 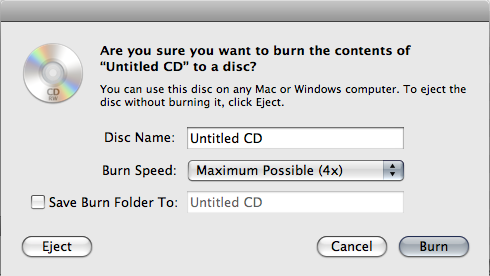 Name the disc and leave the burn speed set to the default value. Now simply click Burn and the process will begin. 12. When the process is finished, hit the eject key (top right key on the keyboard) or simply drag the disc to the trash to eject the disc. Insert the CD-RW into the CD drive; a disc icon then will appear on your desktop. Click on the disc icon. Navigate to the file(s) to restore. Select the file(s) to be restored. Copy the selected file(s) by clicking Edit > Copy. Navigate to the location in which to place the file. 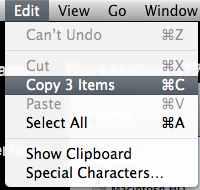 Paste the selected file(s) by clicking Edit > Paste. Files on the CD-RW may be sorted in different ways for display. When clicking on the Date Modified column heading, for example, the files are grouped within headings such as “Today”, “Last month”, “A long time ago”, etc. When clicking on the Name column the groupings are labeled with the letters of the alphabet. CD-RWs, CD-Rs and DVDs scratch very easily. Handle them carefully, only touching the outside rim. If they become scratched, use new media.